The Stockholm all wood bamboo platform bed frame is an attractive and a very durable bed frame. There is no need for an expensive box spring or mattress foundation. However, if you already have a box spring, you can still use it particularly if you want the top of your mattress to be higher off the floor. All mattress types including futon, traditional and all foam can be used with the Stockholm bed frame. Made of Bamboo, with its distinctive “stronger than steel yet lightweight” strength making the Stockholm bed frame the strongest in its class. Bamboo is the most sustainable furniture grade wood with its average of 5 years or less to maturity versus a minimum of 20 years for most other woods. Its versatile and minimalist style virtually matches any decor. The Stockholm looks great against a wall or floating in a room. Sturdy design and construction with 7 heavy duty legs, 12 kiln-dried all wood cross slats. Bed outside dimensions is 81″ x 42″ x 14″ high. Mattress platform is 75-1/2-Inch x 39-1/2-Inch x 10-1/2-Inch from floor to top of platform. Note the mattress platform is about 1/2-inch wider and longer than the mattress to accommodate the bedding. Fits a standard twin-size mattress which is 75-Inch long x 39-Inch wide. Multi-step furniture grade finish provides a durable deep hue for a great lifetime look. Lots of storage space underneath the Stockholm bed frame there is 73-Inch long x 36-Inch wide x 8-inch Loft high of open storage space. The Stockholm all wood bamboo platform bed frame is an attractive and a very durable bed frame. There is no need for an expensive box spring or mattress foundation. However, if you already have a box spring, you can still use it particularly if you want the top of your mattress to be higher off the floor. All mattress types including futon, traditional and all foam can be used with the Stockholm bed frame. Made of Bamboo, with its distinctive “stronger than steel yet lightweight” strength making the Stockholm bed frame the strongest in its class. Bamboo is the most sustainable furniture grade wood with its average of 5 years or less to maturity versus a minimum of 20 years for most other woods. Its versatile and minimalist style virtually matches any decor. The Stockholm looks great against a wall or floating in a room. Sturdy design and construction with 7 heavy duty legs including three steel center support legs, 13 kiln-dried all wood cross slats. Bed outside dimensions is 86″ x 63″ x 14″ high. Mattress platform is 80-1/2-Inch x 60-1/2-Inch x 10-1/2-Inch from floor to top of platform. Note the mattress platform is about 1/2-inch wider and longer than the mattress to accommodate the bedding. Fits a standard queen-size mattress which is 80-Inch long x 60-Inch wide. Multi-step furniture grade finish provides a durable deep hue for a great lifetime look. Lots of storage space underneath the Stockholm bed frame; on each side of the center support rail, there is 78-inch Loft long x 36-Inch wide x 8-inch Loft high of open storage space (matching roll-on-the- floor all wood storage drawer pair available and sold separately). Legs taper from 3.25 Inch to 2 Inch by 1.5 Inch thick. Enjoy trouble-free, ready-to-assemble convenience with all hardware included and email, live and video assembly assistance available. 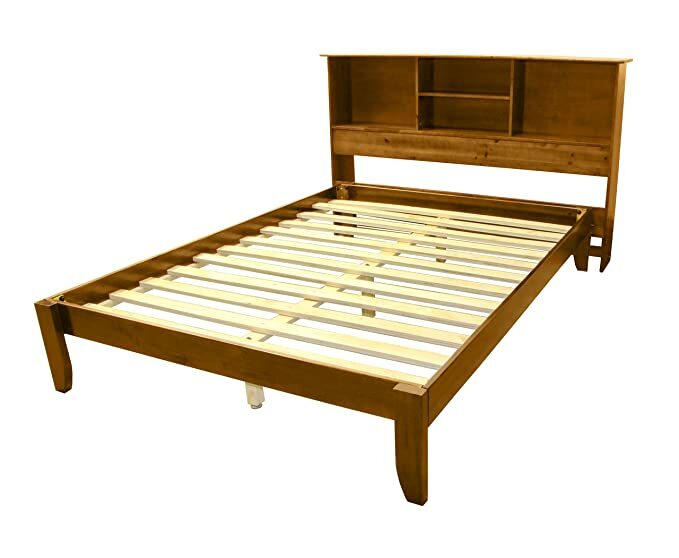 The Stockholm all wood bamboo platform bed frame is an attractive and a very durable bed frame. There is no need for an expensive box spring or mattress foundation. However, if you already have a box spring, you can still use it particularly if you want the top of your mattress to be higher off the floor. All mattress types including futon, traditional and all foam can be used with the Stockholm bed frame. Made of Bamboo, with its distinctive “stronger than steel yet lightweight” strength making the Stockholm bed frame the strongest in its class. Bamboo is the most sustainable furniture grade wood with its average of 5 years or less to maturity versus a minimum of 20 years for most other woods. Its versatile and minimalist style virtually matches any decor. The Stockholm looks great against a wall or floating in a room. Sturdy design and construction with 7 heavy duty legs including three steel center support legs, 13 kiln-dried all wood cross slats. Bed outside dimensions is 86″ x 81″ x 14″ high. Mattress platform is 80-1/2-Inch x 78-1/2-Inch x 10-1/2-Inch from floor to top of platform. Note the mattress platform is about 1/2-inch wider and longer than the mattress to accommodate the bedding. Fits a standard king-size mattress which is 80-Inch long x 78-inch Loft wide. Multi-step furniture grade finish provides a durable deep hue for a great lifetime look. Lots of storage space underneath the Stockholm bed frame; on each side of the center support rail, there is a 78-inch Loft long x 36-Inch wide x 8-inch Loft high of open storage space. The new re-engineered designed Stockholm solid real wood bamboo platform bed frame is an attractive and a very durable wood bed frame. There is no need for an expensive box spring or mattress foundation. However, if you already have a box spring, you can still use it particularly if you want the top of your mattress to be higher off the floor. The top of the platform is 10 from the floor so an 8-inch mattress plus an 8-inch box spring foundation results in an overall height of 26. All mattress types including futon, traditional and memory foam can be used with the Stockholm bed frame. Made of solid bamboo, with its distinctive “stronger than steel yet lightweight” strength making the Stockholm bed frame the strongest in its class. NO fillers, NO press wood! According to the Janka Rating for different types of wood, bamboo is the most durable wood will not crack, scratch, ding, or chip. Bamboo is the most sustainable furniture grade wood with its average of 5 years or less to maturity versus a minimum of 20 years for most other woods. Its versatile and minimalist style virtually matches any decor. The Stockholm looks great against a wall or floating in the middle of the room. Multi-step furniture grade finish provides a smooth wood surface so no snagging bedding with a durable deep hue for a great lifetime look. Sturdy design and construction with 4 heavy duty legs (legs taper from 3 wide to 2 by 1.5 thick) plus one center support leg. Note that there are no legs under the side rails which are guaranteed toe stubbing accidents. The center support rail is a whopping 3 by 1 inch solid wood board. Queen and king sizes have14 kiln-dried solid bamboo wood cross slats with the full and twin sizes at 13 kiln-dried solid bamboo cross slats. Each slat measures 2.313 wide by .313 thick. Do not be concerned with the thin bamboo slats, remember that Bamboo does not break. Space between slats is 3 which meets the requirements for memory foam mattresses. Ensuring long last use and stability, all slats are screwed down at three points, each side rail plus the center support rail. Bed outside dimensions is king at 85 long by 80 long x 14 high, queen at 85 long x 62 wide by 14 high, full at 80 long by 56 wide by 14 high, and twin at 80 long by 41 wide by 14 high. Mattress platform is king at 80.5 long by 78.5 wide by 10 high (from floor to top of platform), queen at 80.5 long by 60.5 wide by 10 high, full at 75.5 long by 54.5 wide by 10 high, twin at 75.5 long by 39.5 wide by 10 high. Note the mattress platform is about 1/2-inch wider and longer than the mattress to accommodate tucking the bedding under the mattress. The Stockholm fits standard mattress sizes which are king at 80 long by 78 wide, queen at 80 long by 60 wide, full at 75 long by 54 wide, and twin at 75 long by 39 wide. Two large underneath storage spaces available are available, king each at 78 long by 38 wide by 8.75 high, queen each at 78 long by 29 wide by 8.75 high, full each at 73 long by 26 wide by 8.75 high, twin each at 73 long by 19 wide by 8.75 high (matching roll-on-the- floor matching all wood storage drawer pair available and sold separately). Headboard dimensions: 40 inches wide x 41 inches high x 10 inches deep. Headboard has two large shelves, interior dimensions 13 x 15 x9 inches; two small shelves, interior dimensions 13 x 8 x 7 inches. Matching nightstand also available and sold separately (search B01M22CCV1). Enjoy trouble-free, ready-to-assemble convenience with all hardware included and email, live and video assembly assistance available. Bed frame only, mattress and bedding sold separately. The Stockholm all wood bamboo platform bed frame is an attractive and a very durable bed frame. There is no need for an expensive box spring or mattress foundation. However, if you already have a box spring, you can still use it particularly if you want the top of your mattress to be higher off the floor. All mattress types including futon, traditional, and all foam can be used with the Stockholm bed frame. Made of Bamboo, with its distinctive stronger than steel yet lightweight strength making the Stockholm bed frame the strongest in its class. Bamboo is the most sustainable furniture grade wood with its average of 5 years or less to maturity versus a minimum of 20 years for most other woods. Its versatile and minimalist style virtually matches any decor. The Stockholm looks great against a wall or floating in a room. Sturdy design and construction with 7 heavy duty legs including three center support legs, 12 kiln-dried all wood cross slats. Bed outside dimensions is 81 x 57 x 14 high. Mattress platform is 75-1/2-inches x 54-1/2-inches x 10-1/2-inches from floor to top of platform. Note the mattress platform is about 1/2-inch wider and longer than the mattress to accommodate the bedding. Fits a standard full-size mattress which is 75-inches long x 54-inches wide. Multi-step furniture grade finish provides a durable deep hue for a great lifetime look. Lots of storage space underneath the Stockholm bed frame; on each side of the center support rail, there are two 36-inch long x 36-inch wide x 8-inch high of drawer storage space. Headboard dimensions: 62 inches wide x 41 inches high x 10 inches deep. Headboard has two large shelves, interior dimensions 20 x 15 x9 inches; two small shelves, interior dimensions 20 x 8 x 7 inches. Legs taper from 3.25 inches to 2 inches by 1.5 inches thick. Enjoy trouble-free, ready-to-assemble convenience with all hardware included. 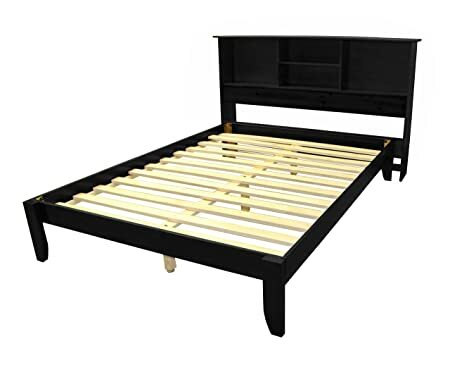 The Stockholm all wood bamboo platform bed frame is an attractive and a very durable bed frame. There is no need for an expensive box spring or mattress foundation. However, if you already have a box spring, you can still use it particularly if you want the top of your mattress to be higher off the floor. All mattress types including futon, traditional and all foam can be used with the Stockholm bed frame. Made of Bamboo, with its distinctive “stronger than steel yet lightweight” strength making the Stockholm bed frame the strongest in its class. Bamboo is the most sustainable furniture grade wood with its average of 5 years or less to maturity versus a minimum of 20 years for most other woods. Its versatile and minimalist style virtually matches any decor. The Stockholm looks great against a wall or floating in a room. Sturdy design and construction with 7 heavy duty legs including three steel center support legs, 12 kiln-dried all wood cross slats. Bed outside dimensions is 81″ x 57″ x 14″ high. Mattress platform is 75-1/2-Inch x 54-1/2-Inch x 10-1/2-Inch from floor to top of platform. Note the mattress platform is about 1/2-inch wider and longer than the mattress to accommodate the bedding. Fits a standard full-size mattress which is 75-Inch long x 54-Inch wide. Multi-step furniture grade finish provides a durable deep hue for a great lifetime look. Lots of storage space underneath the Stockholm bed frame; on each side of the center support rail, there is 73-Inch long x 36-Inch wide x 8-inch Loft high of open storage space. 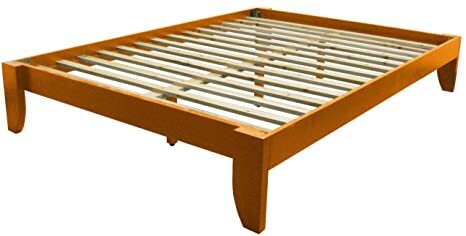 The Stockholm all wood bamboo platform bed frame is an attractive and a very durable bed frame. There is no need for an expensive box spring or mattress foundation. However, if you already have a box spring, you can still use it particularly if you want the top of your mattress to be higher off the floor. All mattress types including futon, traditional, and all foam can be used with the Stockholm bed frame. Made of Bamboo, with its distinctive stronger than steel yet lightweight strength making the Stockholm bed frame the strongest in its class. Bamboo is the most sustainable furniture grade wood with its average of 5 years or less to maturity versus a minimum of 20 years for most other woods. Its versatile and minimalist style virtually matches any decor. The Stockholm looks great against a wall or floating in a room. Sturdy design and construction with 7 heavy duty legs including three center support legs, 13 kiln-dried all wood cross slats. Bed outside dimensions is 86 x 81 x 14 high. Mattress platform is 80-1/2-inches x 78-1/2-inches x 10-1/2-inches from floor to top of platform. Note the mattress platform is about 1/2-inch wider and longer than the mattress to accommodate the bedding. Fits a standard king-size mattress which is 80-inches long x 78-inches wide. Multi-step furniture grade finish provides a durable deep hue for a great lifetime look. Lots of storage space underneath the Stockholm bed frame; on each side of the center support rail, there are two 39-inch long x 36-inch wide x 8-inch high of drawer storage space. Legs taper from 3.25 inches to 2 inches by 1.5 inches thick. Enjoy trouble-free, ready-to-assemble convenience with all hardware included.